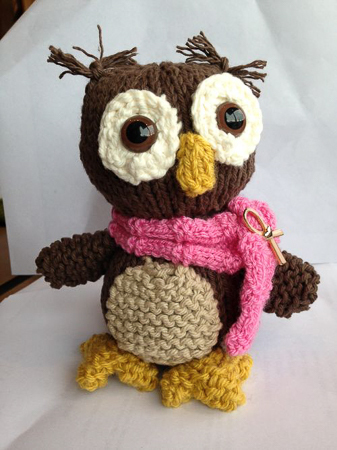 I worked on this owl with my friend Sandy as a gift to a mutual friend of ours. Our friend was diagnosed with breast cancer and is now on her road to recovery. We wanted to let her know how much we were thinking about her and how grateful we are for her recovery. I knitted the parts and my friend put it together. I don’t know how she did it. It seems a daunting task to put it all together. I am so glad she was willing to do that part.